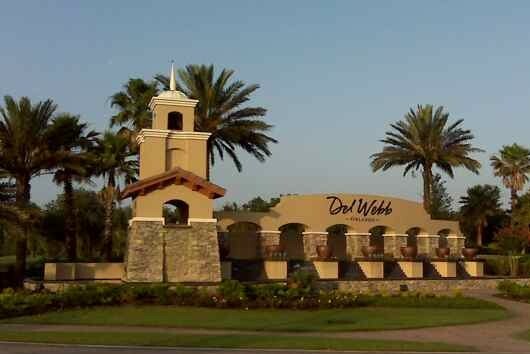 Del Webb Orlando is an impressive 55+ community featuring a world-class collection of amenities including an 18-hole golf course and 12 miles of trails. Set amid scenic lakes and mature trees, Del Webb Orlando is a lovely active adult enclave found within the larger master-planned golf community of Ridgewood Lakes. With lush landscaping and a tranquil atmosphere, this community may seem secluded. However, it is actually situated within close proximity of retail centers, restaurants, medical facilities and other services. When residents want more urban attractions, Downtown Orlando is less than an hour away. Del Webb Orlando originally opened under the name La Cresta by Del Webb in 2006. Though the community has changed its name, its ongoing development continues to make it an appealing destination for active adults aged 55 or better. Upon completion, the community will contain 830 single-family homes. It also offers residents resort-style amenities, including access to the par 72 Ridgewood Lakes Golf Course. Amenities at Del Webb Orlando are largely centered around Montecito, the 30,800 square-foot clubhouse. This beautifully-appointed facility hosts an exciting line-up of social and recreational activities. There are hobby and game rooms, an arts and crafts studio, a computer center, a demonstration kitchen and a grand ballroom. Healthy living is an integral part of life at Del Webb Orlando and Monecito meets that need in many ways. The impressive fitness center includes state-of-the-art cardiovascular and strength-training equipment, an aerobics studio and an indoor walking track. The clubhouse has both indoor and outdoor swimming pools, as well as a variety of sports courts. This lets residents easily take part in a game of tennis, pickleball, bocce ball or horseshoes in addition to playing a round of golf at Ridgewood Lakes. Outdoor amenities continue across the grounds with nature parks, open spaces and 12 miles of walking trails. Residents can make use of the fishing lakes, gardening area and pet park. The outdoor amphitheater is a perfect setting for a variety of events and there is even RV parking and a playground for visiting grandkids. When it comes to residences, Del Webb Orlando currently offers both new construction and resale single-family homes. Homebuyers who are interested in new construction homes can choose from 15 different floor plans ranging in size from 978 to over 2,800 square feet. These homes are divided into three collections: the Garden Series, the Generation One Series and the Classic Series. The Garden Series offers four compact floor plans designed with one to three bedrooms and one-and-a-half to three bathrooms. The Generation One Series has limited availability and offers seven floor plans ranging in size from 1,515 to 2,251 square feet. The Classic Series includes four basic models with many options including second-story lofts. With a fabulous location, beautiful homes and impressive amenities, it’s easy to see why Del Webb Orlando is appealing to many active adult retirees.